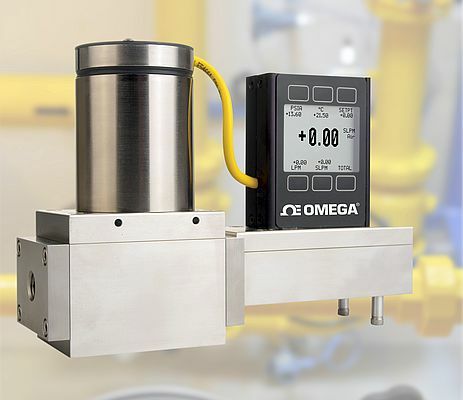 OMEGA's FMA-2600 and FVL-2600 Series mass and volumetric flow controllers use the principle of differential pressure within a laminar flow field to determine and control mass flow rate. A laminar flow element (LFE) inside the meter forces the gas into laminar (streamlined) flow. Inside this region, the Poiseuille equation dictates that the volumetric flow rate be linearly related to the pressure drop. A differential pressure sensor is used to measure the pressure drop along a fixed distance of the LFE. This, along with the viscosity of the gas, is used to accurately determine the volumetric flow rate. Separate absolute temperature and pressure sensors are incorporated and correct the volumetric flow rate to a set of standard conditions. This standardised flow rate is commonly called the mass flow rate and is reported in units such as standard cubic feet per minute (SCFM) or standard litres per minute (SLM). The controller uses a true proportional valve coupled to the flow body to control flow using the integral PID loop controller. Standard units include a 0 to 5V output (4 to 20 mA optional) and RS232 communications. The gas-select feature and the setpoints can be adjusted from the front keypad or via RS232 communications. Volumetric flow, mass flow, absolute pressure, and temperature can all be viewed or recorded through the RS232 connection. It is also possible to multi-drop up to 26 units on the same serial connection to a distance of 50 metres. The FVL-2600 Series comprises volumetric flow controllers only. They do not measure or correct for absolute pressure or temperature. The FMA-2600 Series is recommended if operating pressure is above 1 barg or if there is any restriction or backpressure in the application.